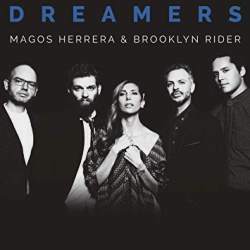 On Dreamers, New York-based Mexican vocalist Magos Herrera and the Brooklyn Rider string quartet squeeze light from shadow. Their meticulous selections share origins in countries whose regimes have historically oppressed creative expression as counter-cultural. Longtime Kronos Quartet listeners will therefore find a familiar combination of artistic and political integrity, while rejoicing in Brooklyn Rider’s distinctly vibrant commitment to the inner lives of repertoire. 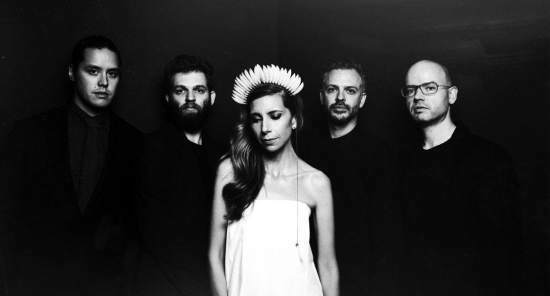 Three songs by Herrera are the album’s support beams. “Niña” (Girl) and “Dreams” set the poetic jewels of Octavio Paz into silver rings, finding timely stories in their occlusions. In addition to tactile performances, the words of both draw out a philosophical heartbeat, which reminds us of places in the mind where even the most violent boots may never tread. “Tú y Yo” (You and I) likewise pays respect to verses of Rubén Darío, blending melody and lyric into hues of self-protection. Other remarkable turns include “Volver a los 17” (To Be 17 Again) by Chilean songwriter Violea Parra for its subtlety and restraint; “La Aurora de Nueva York” by flamenco guitarist Vicente Amigo for its evocation of transit and shadows in the words of Federico García Lorca; and “Undiú” by João Gilberto for its delicate arrangement, courtesy of Brooklyn Rider’s own Colin Jacobsen. A few dips into Brazilian fonts yield more wonders. Gilberto Gil’s “Eu vim da Bahía,” along with Caetano Veloso’s “De Manhã” (In the Morning) and “Coração Vagabundo,” elicit forward motion, as underscored by cellist Michael Nicols. It’s no coincidence that these three are arranged by Jaques Morelenbaum, who included the latter song to haunting effect on 2001’s Casa (featuring his wife, Paula, and pianist Ryuichi Sakamoto). The present version develops like a photograph to show something at once desired and painful to remember.